In this third article we will be comparing the aligned launches of the three 8th generation home consoles worldwide. The Wii U launched on November 18, 2012, the PlayStation 4 on November 15, 2013 and the Xbox One on November 22, 2013. The Xbox One the biggest opening week with sales of 1,125,874. The PlayStation 4 launched with sales of 1,051,921 and the Wii U with sales of 472,099. However, the Xbox One launched in North America and Europe during the same week, while the PlayStation 4 just launched in North America on November 15. It would be released in Europe two weeks later on November 29. The PlayStation 4 was behind in the first two weeks when you align the launches. However, once it launched in Europe it quickly took the lead. When you look at sales during the first seven weeks the PlayStation 4 has sold 4.12 million units, the Xbox One 3.10 million units, and the Wii U 2.37 million units. Lifetime sales of the PlayStation 4 is 1.28 million units more than the Xbox One. The PlayStation 4 has sold 4.38 million units, while the Xbox One has sold 3.10 million units and the Wii U 5.34 million units. Despite being launched a year later the PlayStation 4 is on track to pass it in the first few months of 2014. 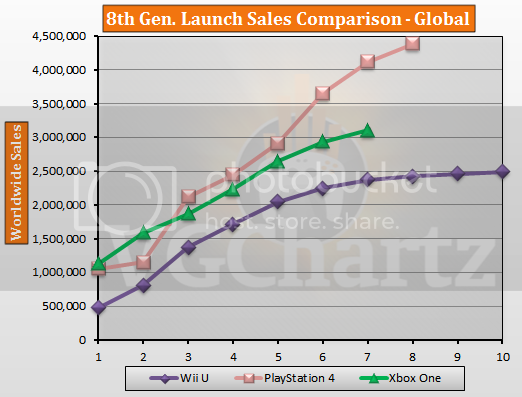 The Xbox One is also on track to pass the Wii U in the first six months of 2014. This guys articles are always poorly written and don't take all things into account. Sorry to say. Global launch without the 2nd biggest market of the world (Japan) is not global launch. Adding it to WiiU makes no fair comparison. Well it makes XBO - WiiU sales fair. XBO won't sell anything noticable in Japan. He said that he will add Japanese data when it launches in Japan. Personally i don't think a wii sports will have the same impact as it did on the wii. It might have a good positive effect in Japan though. The reason everyone wanted it on the wii was because of the controller. Lifetime sales don't look correct given the chart unless those are territory specific. Curious to see just how far MS is willing to fall behind before they yank the Kinect out of the package and drop the price under Sony.